Lock in a great price for Sleep Inn & Suites – rated 8.1 by recent guests! The shower and the location of the place was great. My kids ages 8 and twins 6 loved the pool and breakfast, but to me the bacon tasted like paper or the plate it was nasty. It smelled really good tho lol. The floors were very weak throughout the place. Very modern and clean. Property seemed to be well maintained. Bed was cozy, rooms were clean, food was fresh and tasted good, the kids loved the pool. The room was clean and the bed was comfortable. Everything workked. It was a nice, clean, comfortable room for the cost. Staff was friendly. Check in and check out was quick and easy. The little cheese omelets was a nice touch. Likes and dislikes combined, overall it was a good experience and I wouldn't hesitate to stay again. We especially liked the breakfast bar with the scrambled eggs and sausage. There was a good variety of food. The staff was so friendly and helpful! The special request we had made to be ground floor and close to pool were fulfilled. We were so happy with our stay that we invited family members to stay as well and they were able to get a room next to ours! You helped to make this reunion PERFECT! Lady at front desk was nice and informative of area. Breakfast was better than most hotels. The staff was awesome. The young lady who check us in was very friendly. She even went beyond to let me park in front because I was rushing to get dressed n go to the movies with my family. The breakfast was good too bacon was so crisp n the waffles omg. I love this place. They even have indoor pool so my son had a blast too. To noise people up all night letting there kids run wild. 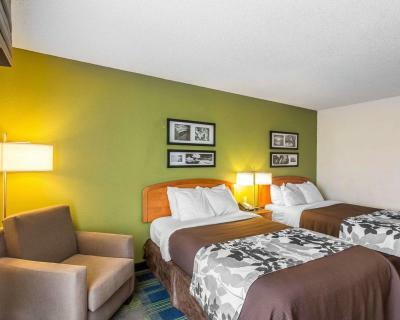 Sleep Inn & Suites This rating is a reflection of how the property compares to the industry standard when it comes to price, facilities and services available. It's based on a self-evaluation by the property. Use this rating to help choose your stay! The Sleep Inn & Suites hotel in Smyrna is conveniently near downtown Nashville. Nashville International Airport and Vanderbilt University are both nearby. Guests will enjoy amenities like, free Morning Medley Hot Breakfast, free wireless high-speed Internet access, free USA Today, free local calls, exercise room and indoor pool. Guest laundry facilities are located on-site. The hotel provides business travelers with conveniences, including two data port telephones with message centers, spacious work areas, a business center and access to fax and copy services. A meeting room is available for hosting special events and business functions. All rooms and suites are equipped with refrigerators, microwaves, coffee makers, hair dryers, irons and ironing boards. When would you like to stay at Sleep Inn & Suites? 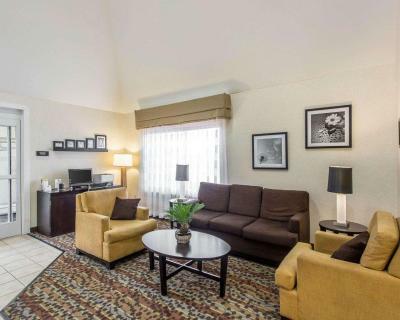 This suite features a microwave, refrigerator and cable TV. This suite features a separate seating area with sofa bed, microwave, refrigerator and cable TV. House Rules Sleep Inn & Suites takes special requests – add in the next step! Sleep Inn &amp; Suites accepts these cards and reserves the right to temporarily hold an amount prior to arrival. Sleep Inn & Suites accepts these cards and reserves the right to temporarily hold an amount prior to arrival. I could’ve gotten a better rate if I had used my military discount instead of Booking.com. No pool towels so we had use our bath towels. Back door wasn't working so we had to walk through front door all down hall to our room next to the exit that we couldn't use. Room card machine didn’t work. Had to get a staff member to let me in room each time. Shower looks like an amateur handyman built it. I was over charged. They put me next to the indoor pool so it was very noisy and I work nights so I sleep during the day. Lots of traffic in the hallways. My key quit working after the 1st night. Had to have it recoded, I was a long way from the lobby and had my hands full. It's ok, stuff happens, but didn't make me happy at the time. Breakfast was typical for a continental breakfast, no like or dislike here, just nothing over the top. Computer was down when I checked out, so had to have my invoice emailed to me. Not a biggie, again, stuff happens, but when I saw it at home, I had a question, so didn't have the opportunity to get it addressed before I left /paid. The room was not the cleanest and the sheets weren't very comfortable. Somebody burnt food in their microwave one night and it stunk our whole floor up terribly. Location was perfect and staff was friendly for the most part. It could have only been better if we had been able to stay longer but we had other obligations in other parts of the state. The fact I was charged for a room I didn’t check into.